A Russian court sentenced a former airline pilot to 4 ½ years in prison for his role in the accident of an Antonov 24 passenger plane that killed 12 people in 2010. 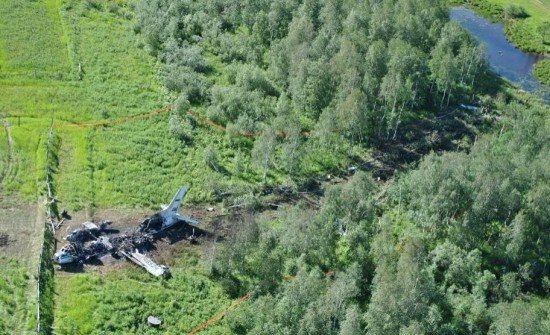 On August 3, 2010, Katekavia flight 57 from Krasnoyarsk crashed while on final approach to Igarka Airport in night time and poor visibility conditions. It struck trees at a distance of 477 meters short of the runway and 234 meters to the right of extended centreline. It came to rest after sliding 140 meters through trees. A fire broke out, destroying the aircraft. All eleven passengers and one of the three crew members were killed in the accident. The Russian Interstate Aviation Committee (MAK) concluded that the weather conditions were below minima. The crew failed to take a timely decision for a missed approach when the plane descended below the minimum safe height (100m) in the absence of reliable visual contact with approach lights and runway lights. MAK stated that incorrect weather reports transmitted to the crew were a factor in the accident. The court in the city of Krasnoyarsk, Siberia, ruled that the captain of the flight could have averted the accident by waiting for better weather conditions, but instead continued his landing approach in poor visibility. The captain blamed the air traffic control service and the airport’s meteorologists, saying that they had misled the flight crew, but the judge rejected his arguments. The captain is going to appeal the verdict.